Briefly, today we had many examples on the desperate measures chavismo is trying to silence dissent, to hide the disaster that Chavez is turning Venezuela into. In other words, all that we see today are the measures taken by a weak government, under lots of pressure, and with no idea on how to solve the problems that surround it. Predictably in such circumstances it is the messenger the first one to be shot. From the dramatic worst to the most stupid. The country's general prosecutor comes out of the closet and demands that freedom of expression be "regulated". Yes, that is right, Luisa Ortega Diaz who has turned out to be a disappointment as big as her predecessor, Isaias Rodriguez, went to the Nazional Assembly to make a proposal (1). She has been unable to make a dent in crime, she has been unable (or is that unwilling?) to make a dent on corruption, she has demeaned herself by going out of her way to put behind bars opposition politicians, she has been as partisan a nazional attorney as chavismo could have hoped her to be. So, realizing that she can hardly sink lower she went all the way out and let the country know that she is there to serve and protect Chavez and as he ordered her a few weeks ago on Globovision she wrote an official legal motivation document to justify that the Nazional Assembly of Venezuela legislates to supress freedom of expression. Es necesario que el Estado venezolano regule la libertad de expresión [..] en el marco de nuestro derecho, del derecho de todos los venezolanos tiene un limite. Reclamo que se le ponga un limite a ese derecho. [...] de los dueños de los medios y de todas las personas que trabajen en ellos. It is necessary that the Venezuelan State regulates the freedom of expression [Freedom of expression] in the framework of our right, of the right of all Venezuelans there is a limit [We must control/regulate] the media owners and all the people that work in media. There, you have it, perfectly clear. Her speech a chilling moment that even left some of the chavista attending stone cold. Of course it is possible that the new law might not be voted after all, that it is just a ploy to force Globovision to tone down, that it is this, that it is that... but the final intention cannot be hidden: tomorrow or in a few months there will be a law to punish those who criticize the government. Thinking will become a crime. The tiny bleached blond woman in her rather electrically tacky blue pseudo Channel turned out to be in the same class as the caricature Nazi Valkyrie of the gulag. Or was that stalag? I get easily confused these days. You can find here the projected law on "media crimes". Just on what I read the first one to be sent to the courts should be Mario Silva of VTV the State TV for he slanderous, violent and vulgar late night show, La Hojilla. But I am pretty sure that he will not be perturbed at all tonight during his show tonight. The crux of that law is of course that it is the state, read chavismo, which decides what will be a "media crime" and which will decide what judge and how this will be taken care of. Today again there was yet another international observation about the lack of judicial independence in Venezuela (in Spanish here). Another journalist is jailed. Gustavo Azocar, noted Tachira journalist, former gubernatorial candidate last November has been put into jail until a trial is completed where he is allegedly involved. It is to be noted that Matos Azocar has gone to every citation he has been summoned to, has claimed his innocence all along, has asked for the trail to be held fast, could have left the country long, long ago had he wanted to, is supported by all opposition and local NGO. But the judge yesterday decided suddenly to arrest him during yet a new hearing, JUST as judicial recess start for the year which means that he cannot appeal his arrest until mid September!!!!!!!! With what you just read above, you can connect all the dots now. Colombia to be cut off from energy supply. In an act of Supreme Hypocrisy Ramirez joined in shooting the messenger. You may ask: Uh? Are we not talking about the press here? Stay with me. In the recent spat with Colombia that started earlier this week over the missing Bofors rocket launchers finding their way to the FARC, Venezuela is at a disadvantage: its dependency on Colombian goods cannot easily be severed for a simple reason, you cannot find find at the drop of a hat the 6 billion dollars of goods that Venezuela gets from Colombia yearly. I mean, long term you could replace them, paying an extra few hundred millions for shipping costs. But it will require maybe a year, maybe two or three because possible providers will need to gear up before they can provide. Colombia will be hurt too but we are the ones that will starve. This is all Chavez economic policies fault since when he came into power the trade surplus was on OUR side, now it is lopsided 6, SIX, times on Colombia's side. There is absolutely no other reason, no other excuse but the failed polices of chavismo. Period. Why is this hypocrite? Because Venezuela is producing everyday less and less oil and byproducts. Cutting off Colombia is a godsend! And if there is contraband at the Colombian border, reported at thousands of barrels a day by PDVSA itself, it is because that contraband is managed by the government officials that make a killing out of it. I mean, does anyone think that if the Nazional Guard was doing its job the contraband to Colombia would be that high? For chrissake, you can see gas trucks from a small airplane without any problem, and you can block all the roads they require easily!!!!!!!! The more so if it is a line of gasoline trucks! Two things here. Ramirez is trying to blame the victim and hiding what is coming our way (deflecting what is coming his way? 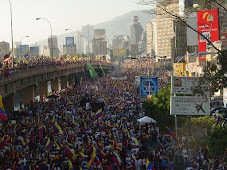 ), the penuries that we would experience in the next few months if really Chavez blocks Colombian trade. As such Ramirez is giving false information, while acknowledging that he has not controlled the contraband to Colombia. As such, if he were not so pathetically ridicule, he should be the first one to be jailed in the new media crime law, for promoting misleading information. 1) More complete articles in Spanish here, with video and here.